THE BROOK at 1037 S. Longwood Ave. has dried up, leaving leaves and mud in its place. Brookside is perhaps best known for its namesake, a natural stream that flows through the neighborhood. But in recent months, local residents have raised an alarm about the brook’s health. Originating from sources in the Hollywood Hills, the El Rio del Jardin de las Flores travels south, underground at times, until it reaches Brookside backyards along Longwood Ave. on its way to Ballona Creek and the ocean. The waterway behind the houses has been a home to crawfish, frogs and koi for nearly a century, until now. Among residents, opinions vary in regard to the severity of the problem. According to Boeck, the situation is different for each homeowner; for some, the water ebbs and flows; for others, the water is completely gone. To get answers, Boeck and other residents have invited city officials to investigate. Among those who recently made a site visit were staff from the Los Angeles Dept. of Public Works and Councilman David Ryu’s office. “My neighbors on the stream and I are very concerned about the health hazard due to mosquito infestation in our stream beds, which are nearly all dried, and eagerly await a report from you,” read a Nov. 6 email to Ryu’s staff from Boeck on behalf of a group of concerned residents. Speaking to the Chronicle, Ryu spokesperson Estevan Montemayor confirmed that council staff made a site visit. And they did notice low water levels at some homes. “It might be debris blocking the water, but more information is needed,” he said. Moving forward, Ryu’s office has suggested that neighbors map out which properties have the worst water issues to help investigators localize the issue. Longwood Ave. homeowner Ethlie Ann Vare says she doubts that the issue is related to drought. “The brook was fine during four years of the drought. Then it dried up suddenly, after the drought ended. It feels like it was some kind of an event, as if someone turned off the spigot,” says Vare. Having owned her home since 1999, Vare says she has learned that the brook has flowed through these backyards for 100 years, during many periods of drought, “but this is the first time that the water has dried up,” she says. 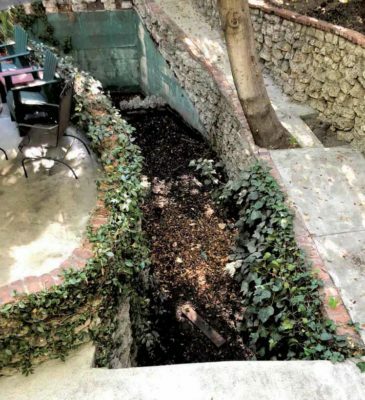 As to possible low-water culprits, rumors that have swirled among neighbors range from deliberate blockage by a developer, to the flow being diverted by a city agency, to the Wilshire Country Club interrupting the flow. In its journey to Brookside, the Rio del Jardin de las Flores first flows aboveground through the Wilshire Country Club golf course before the water returns underground via a concrete culvert near the intersection of Third St. and Hudson Ave.
To find out how the urban stream has performed recently on Hancock Park’s tony golf course, we turned to Doug Martin, director of agronomy at the Wilshire Country Club. The mystery continues. Watch this space.